Talion and Celebrimbor return to Mordor to hack off orc heads in Middle-earth: Shadow of War, but can they slice and dice without error on PC? 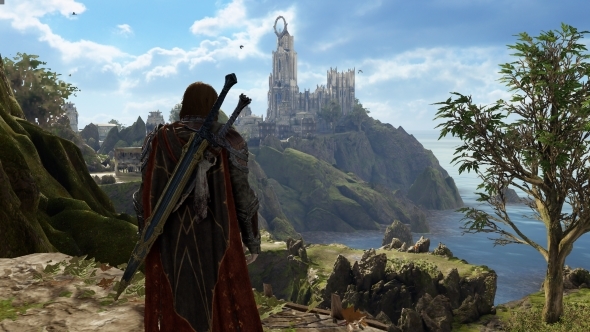 With all the lush forests, snowy mountains, and classic volcanic landscapes of Mordor to render, there is plenty going on that could bring a PC to its knees. But have developers Monolith forged their sequel from Mithril or tin? 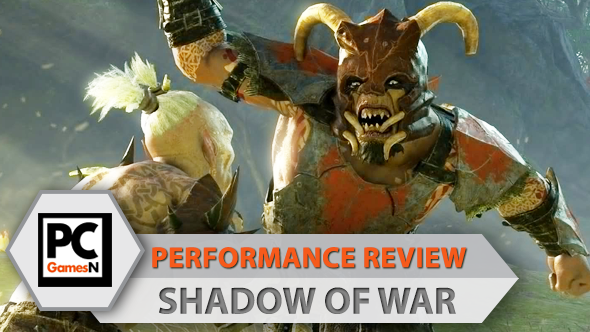 There is only one way to find out: welcome to the PCGamesN Shadow of War performance review. Want to know how the game scored? Read our Middle-earth: Shadow of War PC review. Our performance reviews are written to offer you the broadest picture possible, focusing on hardware similar to what the majority of players have installed in their machines. We test the game on all graphical settings using an i5 powered rig with 8GB of RAM, and try to hit the 60 fps mark with four of the most popular graphics cards. Even if your PC is not identical to our test setups, you should still be able to estimate the performance levels you can expect from your own machine. 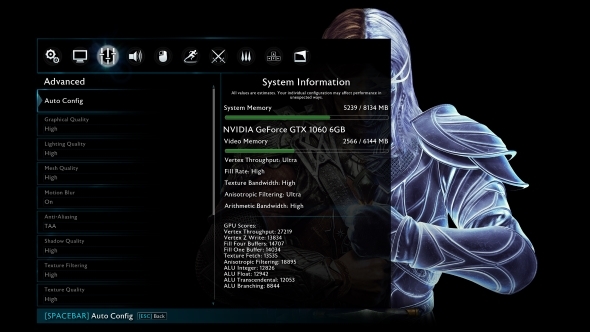 Shadow of War has a robust graphics menu, filled with both regular and advanced-level options. 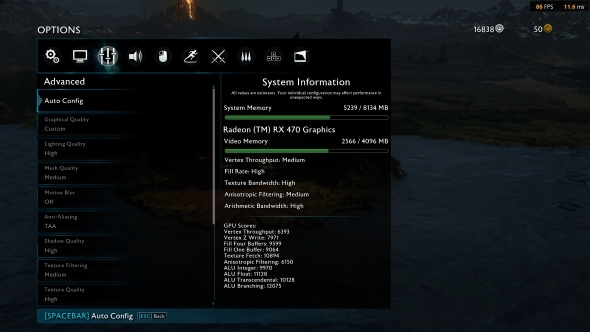 On the right-hand panel, a system information graph displays how far your chosen setup pushes both your main system and video memory, and a score tally below reveals how your GPU fares with a variety of rendering technologies. The latter will only be meaningful if you are aware of the intricacies of graphics card technology, but the graph provides an easily understood indicator of how far you can push your rig. The options themselves are broad, covering overall graphical quality, and individual elements such as lighting, mesh, shadow, and textures. Most options are available in the standard options of low, medium, high, and ultra, but the overall quality selector also provides very low and very high options, allowing for a more granular approach. Anti-aliasing is available in TAA and FXAA flavours, and there are toggles for depth of field, ambient occlusion, and vegetation, too. 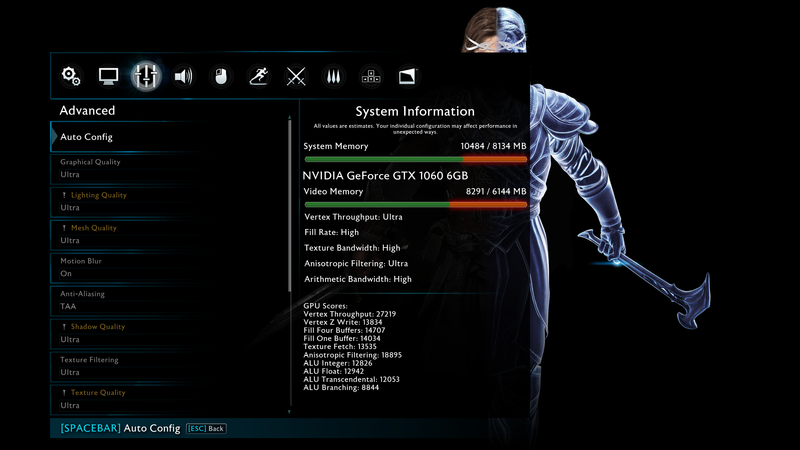 There is also a built-in benchmark tool, which provides a fairly detailed log report. While useful, be aware that the results of this tool are not the truest reflection of in-game performance. Our benchmark results tended to be around eight frames higher than our in-game results. As is becoming increasingly frequent in gaming, Shadow of War supports dynamic resolution, which will scale your image in order to balance performance. This is the system used by console developers to maintain good frame rates. To keep the game running at your native resolution, be sure to turn this off. For our graphics analysis we compare screenshots taken on the four standard presets of ultra, high, medium, and low. Unlike many modern games, Shadow of War does not require the game to be rebooted to apply new texture settings. There is a loading bar you will have to wait for, but other than that, in-game setting changes are painless. Cast your mind back to Shadow of Mordor, and you should remember that it was a good-looking game, albeit nothing remarkable by 2014 standards. Shadow of War arrives with much the same approach; it is certainly a pleasant game to look at, but doesn’t excel in any area. The above ultra shot – which sports the game’s humongous HD texture pack – demonstrates the lusher landscapes, with good foliage and scattered leaves as a finishing touch. Ground textures are lovely, with pitted, rough stone. Depth of field produces a lovely vista, with the far-off fortress appearing justout of focus for an authentic image. On a PC similar to ours, you will find Shadow of War runs at an average of 53fps on ultra, which is nothing to grumble about considering the scale of the environments. Moment to moment, though, this doesn’t feel consistent: there is certainly some slowdown and stuttering here and there. We have also found that, when played on a traditional mechanical hard drive, the game takes ten minutes or so to ‘warm up’, with average frame rates being close to 20fps to begin with. This problem did not occur with SSD drives. This is likely down to the drive struggling with texture streaming – those HD files are massive, afterall. There is very little difference between ultra and high. Look close enough and you will be able to see the difference in textures and lighting – the ground appears less riven and the shading is missing from the grass and bushes around the base of the tree – but the overall effect is not spoilt. Shadows suffer a fraction, with the leaves casting a slightly blurrier shape than they do on ultra, but the lighting model is otherwise still strong. The reduction in quality leads to a solid leap in performance: our results show an average of 73fps. The experience is perfectly smooth, absent of any of the stuttering seen on ultra. Consider this our ‘recommended’ option. There is an immediately obvious drop-off in quality when reducing to medium. The rocks in the middle distance have had a noticeable texture reduction, with the moss now appearing as green, blurry-edged splotches. The ground textures have been downgraded, with the riven effect less detailed. Foliage density appears reduced, with the trees on the right and left of the image looking slightly less lush than before. Overall, lighting is less complex, with more simple-looking shadows. Long-distance detail suffers, too, with the caragor cage on the left now appearing blurred and less detail present in the fortress. The performance tradeoff for such quality is solid as we hit an average frame rate of 97. The reduced image fidelity is not ideal, but should your hardware not be up to the challenge, medium settings are rough, but certainly not ugly. You will immediately notice that the entire image looks much brighter on low settings. That is due to the reduction in shadow quality. This does not help mask the huge drop in texture quality, which now makes all surfaces appear blotchy and smeared. Items in the middle distance are reduced to messy, pixelated shapes, with the left-hand tree suffering the worst treatment. Far-off items appear very low-res, and the entire scene is literally roughened around the edges thanks to a lack of anti-aliasing. It is Shadow of War at its worst, but hopefully you will have no need to play on such settings. Our test rig runs low settings at an average of 101fps, which is a respectable boost, but certainly not an acceptable trade for the reduction in fidelity. Consider this setting only for those with PCs able to claim a bus pass and pension. To see how Shadow of War performs on various hardware setups, we test the game on four graphics cards: two from Nvidia, and two from AMD. We have sampled popular cards from the current and last generation of GPUs in order to offer the most useful information. All four cards are tested at ultra settings, with every texture option set as high as they will go and every graphical effect turned on. For the test we play a 60-second sample that involves running, jumping, and melee combat. The same section is repeated three times in order to find an average. The results are pretty standard fare for an open-world game. Those massive environments mean frame rates are hampered – not even our GTX 1060 came close to an average of 60fps – but the game’s solid overall optimisation ensures a playable experience on all cards. All our lower-end GPUs averaged above 30fps, meaning even those with less expensive hardware can enjoy console-beating performance. How does Shadow of War run in 4k? Shadow of War’s performance is solid at 1080p, but what if you own a 4K display? Our UHD test rig – rocking an i7 6700K CPU, Nvidia GTX 1080, and displaying on an Acer Predator 4K monitor – performs well. At a huge 3840 x 2160 resolution on ultra settings, Shadow of War runs at an average of 33fps, and a minimum of 11fps. While that is obviously a far cry from 60fps, it is still a very playable frame rate. It should be noted that this is at a fixed – not dynamic – resolution. Shadow of War runs at native 4K/30fps on Xbox One X, so a typical 4K PC rig can easily match this. In this section we comb through every graphics option on each of our four test GPUs in order to find out how to run Shadow of War at an average of 60fps. If you are running Nvidia’s popular last-gen graphics card, you will be pleased to know that 60fps can be achieved with the majority of options set to high. The only setting you will have to adjust is ambient occlusion, which will need to be set as medium. Despite being the higher end card in our test, the GTX 1060 cannot quite hit a solid 60fps at ultra settings. Instead, you will want to opt for the simple high preset, which assigns high quality settings to all options. The R9 390 can hit 60fps provided you are happy to settle for a mostly medium quality setup. Apply medium to settings other than texture quality, which you can notch up one level to high. This will provide a smooth, pacey frame rate, and the overall image should still look pretty nice, if not minutely detailed. Achieving 60fps on AMD’s RX 470 requires a mix of high and medium settings. Lighting, shadows, and textures can all be set to high, while meshes, ambient occlusion, vegetation, and texture filtering should be set to medium. Our Shadow of War testing reveals that Monolith have put together a respectable PC build, with a solid collection of platform-specific options and good performance. Overall, it is exactly what I would expect from any open-world game running on mid-range hardware; imperfect when played on ultra, but console-beating performance at high. And for anyone playing on more premium hardware, you can expect Shadow of War on PC to leave the Xbox One X version in the dust. The game is huge, though: you will need 100GB of free space to install it, thanks to a 70GB base game install and a 30GB high-definition pack. If you are not intending to play on ultra, uncheck the HD packs from your install as they are simply a waste of space. If you do intend to play on ultra, be sure to play on an SSD – the stuttering and slowdown from traditional drives when streaming in those massive textures ruin the game’s flow. If you have been suspicious of the PC versions of Warner Bros.’games since the days of Arkham Knight, you can rest assured that the same issues are not present with Shadow of War. Simply put, Monolith have done a great job with the PC version. Fear the orcs, but don’t fear the port.